How Are YOU Watching These Olympics? So how are you watching these Olympics (if at all)? I have to say, the whole time 15 hour time difference between here and PyeongChang isn’t exactly helping, either. I don’t have cable, but have been recording the games via my TiVo and over-the-air broadcasts on NBC. The problem is, by the time I’m ready to watch a prior’s day performance, fast forwarding through the parts I want to watch, the morning news shows have already blown the news: Shaun White won his THIRD gold medal in snowboarding! I guess you can’t embargo the news of a gold medal so easily (although NBC has tried). And I still go back to fast forward and see all the juicy bits, like Shaun flying through the air in one of his “1440s.” That way, I skip all the commercials. The Wall Street Journal’s “CMO Today” e-newsletter today reported that NBC’s partnership with Snapchat for the Olympics is paying off, with 32 million users having watched its coverage thus far. Snap reports well over 90 percent of its audience watching Olympics coverage is under 35. All the people over 35 still think Snap is a tea-like drink (Snapple). I also tried to download the NBC VR app so I could see Shaun flying through my VR goggles. Boy, was that a mistake. NBC wanted me to first lay claim to which cable provider I use. Will they never learn? Here I was, ready to go out of my way to download this VR app from NBC, and they were worried about whether or not I was paying a cable bill, instead of getting my eyeballs (and, presumably, driving up their ad rates). The very same day, Ryan Murphy, he of “Glee” and “American Horror Story” fame, signed a $300 million, multi-year deal with Netflix. Not with NBC or Disney or ABC. This is the beginning of the end of the beginning, a new day for content consumption is at hand. I recently gave up my HBO habit. I was tired of paying the premium through my AT&T U-Verse subscription, and I’d been putting off for far too long giving some money to The New York Times digital edition, content from which I consume daily. So far, it’s been a mostly fair trade. Though I’m going to miss shows like “Game of Thrones” and “The Newsroom” and “True Blood,” as well as Bill Maher (especially during the political season), I figured being able to get all of the Times’ content on any of my digital devices (and I have many!) at any time was easy math: The digital paywall became more forbidding than the bundle became enticing. No sooner do I make this move, than I read in Variety this morning that HBO is going to give the Nordic countries the opportunity to cut the chord by allowing folks to subscribe to HBO without having to have an HBO pay-TV subscription. The Variety story dug deeper into the Nordic permafrost, indicating this was a competitive matching move, an announcement short on the heels of Netflix announcing its move into Sweden, Norway, Finland and Denmark. I laugh at this — I don’t live in a Nordic country, what good does this do me??!! I did visit Stockholm once — could that qualify me for a subscription??? It’s no wonder more and more people are cutting the cord on cable TV. Cable has a business model for offering content that is completely antiquated, and entirely out of line with the direction of more a la carte offerings in a digital world. I only cut a small piece of the cord…this time around…but unless I’m giving more choices and flexibility in content soon, as opposed to their traditional bundling…well, HBO isn’t the only habit I can break. Whoa, what ants got into Amazon.com’s pants this quarter?? Amazon announced earnings earlier today, and though profits for the first quarter dropped 35 percent to $130 million from last year’s same quarter, revenue jumped 34 percent to $13.2 billion, beating the Street’s expectations. Is this a bellwether indicator for e-commerce en generale, or is it isolated to the ‘Zon? Hard to say, but The Wall Street Journal is reporting that part of Amazon’s spending has gone towards making itself operate more efficiently. If you remember, Amazon spent a cool $775 million to buy Kiva Systems last month, which is intended to help them automate and lower their warehouse operations costs. In the quarter, Amazon also introduced a new version of its Kindle for iPad app, which is the #5 free iPad app of all time and the #1 free books app on iPad. The Amazon left jab strikes Apple on the chin! Pow! I may have even contributed to the strong quarter with a few Amazon purchases meself, come to think of it! For my money (what little I have left of it after shopping with Amazon), this digital trend is a larger barometric indicator — folks are finally getting more comfortable with consuming books and other media in digital formats, and though it certainly has a negative impact on the “traditional” media industries on one side of the balance sheet, that starts to get offset as the digital column increases. Of course, I haven’t even gotten to some of the social commerce trends which Amazon is also likely benefiting from (mentions via Facebook, Twitter, etc.) and their own leading adoption of customer ratings and reviews. Click, mortar, AND pixels is the name of the game for smarter commerce, something IBM thought leaders will be discussing at the upcoming IBM Global Smarter Commerce Summit in Madrid May 22-24th. More on that in a prior post here. I picked a heckuva week to travel up to Boston. I arrived the same day as the Boston Marathon, and apparently, the weather this year for the run was “hellish.” In fact, I met a guy on the rental car shuttle bus who had just run the marathon, and he explained all he wanted was a beer, he was SO sick of drinking Gatorade to stay hydrated during the race. But also this week, we’re witnessing the 100th anniversary of Fenway Park, one of the classic old baseball parks and home to the 7 time World Series champion Boston Red Sox. No sooner do I arrive in Boston than I start reading that former Texas Rangers manager Bobby Valentine is stirring up agita amidst the player ranks in Boston — ah, we miss you down in Texas, Bobby. I’m expecting to attend the Rangers/Red Sox game this evening at Fenway, my first time there. I’ll be the crazy Texan along the third base line wearing the cowboy hat (not really). Since age-based segmentation schemes no longer suffice in the connected consumer era, IBM Media & Entertainment is finding that behavior-based segmentation is now essential. 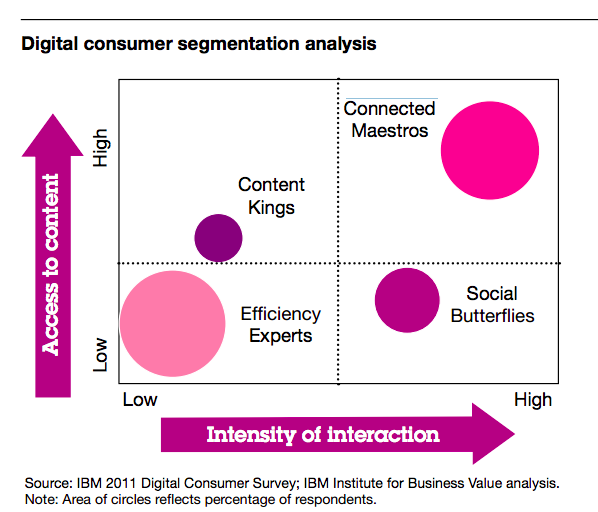 IBM's 2011 survey revealed four prominent types of digital personalities that are not age-based, but instead are based on the combination of degree of access to content and intensity of content interaction This type of analysis is now essential to delivering compelling consumer experiences. Now, out in viva Las Vegas, the National Association of Broadcasters show has kicked off. As part of the festivities, IBM just released a new IBM study of the media and entertainment market, which reveals that as consumers adopt an increasing number of digital devices, four distinct new “digital personalities” are emerging. Think Sybil for iPad users! This shift, in turn, is compelling companies to adopt more innovative business models that deliver personalized experiences. Here’s some details behind the study: First, not all these folks are college students, contrary to popular belief. Sixty-five percent of respondents aged 55 to 64 report surfing the Web and texting with friends while watching TV. Take that, young whippersnappers. Eighty-two percent of surveyed global consumers aged 18 to 64 embracing connected digital devices. And more than 50 percent of consumers in China and the United States are moving away from traditional forms of media and using online sources for breaking news. Efficiency Experts: With 41 percent in this category, these respondents use digital devices and services to simplify day-to-day activities. Efficiency experts send emails rather than letters, use Facebook to communicate with others, access the Internet via mobile phones, and shop online. Content Kings: Are generally male consumers, who frequently play online games, download movies and music, and watch TV online. This audience represents 9 percent of the global sample. Social Butterflies: Place emphasis on social interaction – they require instant access to friends, regardless of time or place. Fifteen percent of consumers surveyed reported they frequently maintain and update social networking sites, add labels or tags to online photos, and view videos from other users. Connected Maestros: 35 percent of those surveyed take a more advanced approach to media consumption by using mobile devices and Smartphone applications to access games, music, and video or to check news, weather, sports, etc. According to the IBM study, media and entertainment companies’ payment infrastructures need to be flexible and scalable to allow a variety of innovative pricing approaches to attract consumers with different preferences to their content. The need for payment option flexibility, even for the same set of consumers, is apparent by looking at those most active in adopting new devices. This group’s preferred mode of payment to watch a movie on a website is by viewing advertising that is included with the movie (39 percent of this segment chose this option), while they prefer to see movies on a tablet by purchasing a subscription (chosen by 36 percent). But to watch movies on a smart phone, they prefer to pay per use (the payment choice of 36 percent). IBM surveyed 3,800 consumers in six countries – China, France, Germany, Japan, the United Kingdom and the United States for this study, and also met with global representatives in broadcasting, publishing, as well as media service agencies, and telecommunication providers, to evaluate digital consumption behaviors. You can register to download the full report here. Remind me never to get fired by Yahoo!. CEO Carol Bartz was fired by Yahoo!’s board chairman overnight. They fired her via the phone. Bartz also sent out an email, from her iPad, to the Yahoo! troops, telling them, and the world, that she was fired via the phone. Hey, at least they didn’t break up with her via Yahoo! Messenger. Oh, that’s right, nobody uses Yahoo! Messenger anymore — that would have been kinda difficult! I dunno, aside from being downright rude, firing someone in this day and age via telephone seems kind of primitive, especially for a technology company like Yahoo! Couldn’t they have used a Google Hangout or something to deliver the news pseudo face to face? Kind of like that character in the George Clooney movie, who fires people via videocast. I’m thinking even carrier pigeon might have been more suitable. It’s a more personal touch — oh look, this nice pigeon just showed up on my front stoop! You know, for when you care enough to send the very best — and you don’t want to hear any protestations about the firing. Hey, I’ll cut the Yahoo! chairman a little slack — delivering bad news is never easy, no matter how you deliver it. But judging from the reaction, there’s not been a lot of love lost in Yahooville. The latest ratings for Bartz on Glassdoor by Yahooligans show about a 33% approval rating, a long, double black diamond downhill slide from 90% when she first joined the company in 2009. We’re less than 24 hours away from financial Armageddon. I’ve been stocking up on water and non-perishables in my garage, just in case. No no, no tin foil helmet radio for me. Justttt kiddingg. I’m confident our politicians are going to reach some fiscal sanity, and my understanding of the process is that the Senate is about to vote on the bill passed last evening by the House, so my fingers are crossed. But let it be known that the U.S. Congress isn’t the only legislative body that’s busy attending to the peoples’ business. In Japan, IBM announced yesterday that it’s helping the National Diet Library of Japan, the country’s only national library, to digitize its literary artifacts on a massive scale to make them widely available and searchable online (The Diet is the legislative body in Japan). The prototype technology enabling the system was built by IBM Research and allows full-text digitization of Japanese literature to be quickly realized through expansive recognition of Japanese characters and enabling users to collaboratively review and correct language characters, script and structure. The system is also designed to promote future international collaborations and standardization of libraries around the world. “Nearly two decades ago in his book Digital Library, Dr. Makoto Nagao, the director of the National Diet Library, shared his vision that digitized and structured electronic books will dramatically change the role of libraries and the way knowledge will be shared and reused in our society,” said Dr. Hironobu Takagi, who led the development of the prototype technology at IBM Research – Tokyo. Compared to other languages, which rely on just a few dozen alphabetical characters, Japanese is extremely diverse in terms of script. In addition to syllabary characters, hiragana and katakana, Japanese includes about 10,000 kanji characters (including old characters, variants and 2,136 commonly used characters), in addition to ruby (a small Japanese syllabary character reading aid printed right next to a kanji) and mixed vertical and horizontal texts. Aside from ensuring quality recognition of Japanese characters, IBM researchers aimed to optimize the amount of time needed to review and verify the accuracy of the digitized texts. By introducing unique collaborative tools via crowdsourcing, the technology allows many users to quickly pour through the texts and make corrections at a much higher rate of productivity and efficiency.